Pets and Human Illness - What's the Connection? Pets and Human Illness – What’s the Connection? If you have ever owned a pet, you know first hand about the benefits of the human-animal bond. Pets, whether they are sole companions or family members, provide more than companionship. Studies have shown that pet owners experience relief from stress when they interact with their pets. However, you may be sharing more than your home with your beloved pet. Being aware of zoonotic diseases – diseases that can pass from animals to humans – will help keep both you and your pet healthy. Often transmitted to humans through cat feces, toxoplasmosis is an infectious disease that may produce flu-like symptoms in people. While cats usually do not exhibit any signs of infection, if you notice a loss of appetite or lack of energy in your pet, your cat may be infected with toxoplasmosis. Remove solid waste from litter box daily. Wear disposable gloves when cleaning litter box. Wash hands after coming into contact with feces. Wear gloves when working in gardens, as neighborhood cats may leave feces in these outdoor areas. Pregnant women and individuals with suppressed immune systems (HIV patients) should avoid all possible contact with cat feces, including litter boxes. Unborn children exposed to toxoplasmosis during their mother’s pregnancy may develop birth defects. Young pets and pets with diarrhea are common carriers of parasites, like roundworms. Roundworm eggs can easily pass from pets to people through the mere handling of an infected animal. Roundworm may cause vomiting in your pet and appear as strands of spaghetti in your pet’s stool, although it would be rare to see the worms unless your pet was recently wormed. Serious human health concerns stemming from the ingestion of roundworm eggs include blindness. Skin diseases that can be transferred from our pets to ourselves include ringworm, which is caused by a fungus. Ring-shaped skin lesions, caused by contact with fungus on an animal’s skin, are indicators of ringworm infection. 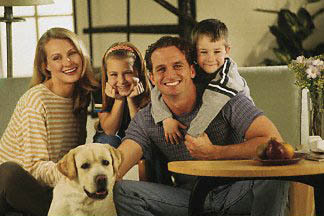 Visit Pets and Parasites for more information on the causes and treatment of parasites. Often called cat scratch fever, this disease is caused by Bartonella, a bacteria carried by fleas. Cats transmit the infection via bites and scratches. Once exposed, most people develop only a minor fever. However, those with suppressed immune systems may develop more serious medical conditions, including spleen enlargement and heart valve problems. Medium- to large-sized dogs are the cause of 80% of all animal bites. Over 50% of human victims are under 20 years old – many of those being under 10 years old. Pasteurella multocida, a naturally occurring bacteria found in the mouths of dogs and cats alike, can lead to infections in humans. To find out how to take care of a dog or cat bite, visit familydoctor.org. Supervise young children when dogs are present. Be alert when jogging, bicycling, skating or walking through public parks, particularly late in the afternoon and evening during the warmer months, when more dogs are apt to be outside. Take extra caution with the elderly, as bites can result in serious health problems for those with compromised immune systems. Infected wildlife is the main source of rabies which is spread through bites from rabid animals (animals already carrying the disease). An annual rabies vaccination can help protect your pet from this fatal disease. Unexplained behavior changes or sudden aggression may be a sign that your pet has contracted rabies. If you think your pet may have rabies, isolate the animal and call your veterinarian immediately. Salmonella bacteria is most commonly associated with raw chicken and eggs. However, most reptiles are also carriers of salmonella. Always wash your hands after handling your reptilian pet. Keep reptiles out of the kitchen where bacteria may spread to food. Never use kitchen sinks or bathtubs to bathe your pet or to clean their cages and food dishes. Psittacosis, also called Chlamydiosis as well as “Parrot Fever,” is an infection commonly associated with parrots, pigeons, hawks and other avian pets. Inhaling dust from dried bird droppings from infected birds can result in flu-like symptoms in humans. Antibiotics may be prescribed by your veterinarian to treat infected birds. The information in this article is based on “Pets and Human Illness: What’s the Connection?” presented October 21, 2003 at The Ohio State University Mini Med School, and was adapted for use on NetWellness with permission, 2004.